HARRISBURG – Rep. Karen Boback (R-Luzerne/Lackawanna/Wyoming) is a recipient of the Guardian of Victims’ Rights Award from the Marsy’s Law for Pennsylvania organization for her support of equal rights for crime victims through assurance of ensuring constitutional protections. The Guardian of Victims’ Rights Awards are presented to individuals who have served as advocates and ambassadors for crime victims across the state, working to ensure they are treated with dignity and respect. Marsy’s Law legislation (House Bill 276), which Boback co-sponsors, was recently passed by the House Judiciary Committee and sent to the full House of Representatives for consideration. For the state constitution to be amended, legislation must pass in two consecutive legislative sessions before being added to the ballot for voter approval. 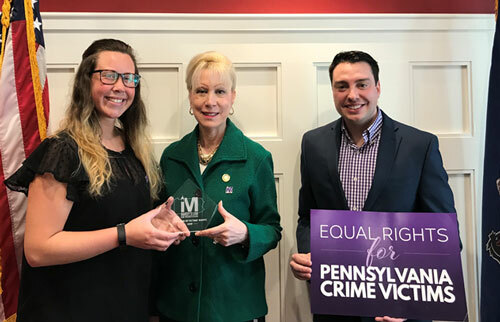 Rep. Karen Boback (R-Luzerne/Lackawanna/Wyoming) is a recipient of the Guardian of Victims’ Rights Award from the Marsy’s Law for Pennsylvania organization for her support of equal rights for crime victims through assurance of ensuring constitutional protections. Pictured with her (from left) are Madison Scarfaro, a member of Marsy’s Law for Pennsylvania’s field staff, and Bill Jones, political director for Marsy’s Law for Pennsylvania.